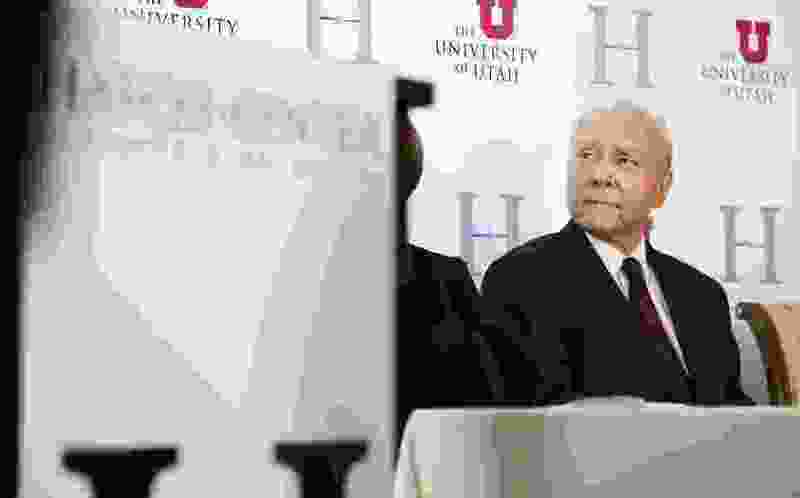 (Leah Hogsten | The Salt Lake Tribune) Senator Orrin G. Hatch and The Orrin G. Hatch Foundation announced Wednesday, May 2, 2018 of a formal partnership with the University of Utah to erect a new facility to house Senator Hatch's archives from his 42 years in the Senate as well as offer forums to help train future leaders and discussions of policy. The new facility will be located across the street from the Thomas S. Monson Center at 411 E. South Temple and will honor the legacy of Utah's long-serving senator who is retiring early next year. Thanks to efforts by two of Utah’s members of Congress, the nation soon may have a three-digit suicide and mental health crisis hotline similar to dialing 911 for other emergencies. Without comment, President Donald Trump signed into law on Tuesday legislation sponsored by Rep. Chris Stewart and Sen. Orrin Hatch, both Republicans, to require the Federal Communications Commission to study the feasibility of such a hotline. It is also ordered to recommend which three-digit number would be best for the hotline, examine the effectiveness of the current National Suicide Prevention Lifeline and Veterans Crisis Line, and recommend ways to improve the current system. Stewart and Hatch hailed the new law and said it is long overdue. “We now have the opportunity to make the National Suicide Prevention Hotline more accessible and easier to remember,” Stewart said. “By creating a hotline dialing code that is short and easy to remember, we are taking an important step towards potentially averting tragedy. This new law truly has the ability to save lives." Utah ranks fifth in the nation for suicide deaths per capita. A version of the bill sponsored by Stewart passed the House on a 379-1 vote, and the Senate passed an identical bill by Hatch. It later adopted the House bill and sent it to Trump. The single nay vote in the House came from Rep. Justin Amash, R-Mich., who said he applauded the goal but felt it was beyond the purview of the federal government. “It’s another good idea without a constitutional basis,” he tweeted at the time.